Wright State nursing students use high-tech patient simulators to practice caring for patients. “It hurts,” moans Andy Techy, as nursing student Olivia wraps a bandage around the gaping wound on his shin. In the next room, junior nursing major Janelle listens to a young child’s labored breathing with a stethoscope. After pausing to check his elevated pulse, she reaches for the phone to call a doctor. Just down the hall, senior nursing student Carlos assists with a complicated delivery, eventually holding the newborn baby boy in his arms. It could be any hospital on any day. But it’s not. These students aren’t in a hospital at all. Even more unusual, none of their patients are real people. At all levels of their education, Wright State nursing students use patient simulators to practice caring for patients. But these aren’t the simple plastic “dummies” used in a basic CPR class. They are sophisticated, high-tech mannequins capable of mimicking a vast range of illnesses and injuries. “Education literature tells us that students need more hands-on experiences, and simulation is one way we can do that,” said Sherrill Smith, Ph.D., assistant professor in the College of Nursing and Health (CONH). 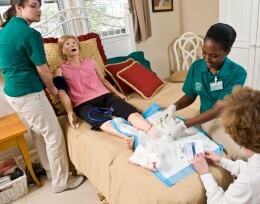 Nursing courses use a variety of simulation techniques, but the most common is the use of robotic simulators. These mannequins come in several types, some more lifelike than others. The college has a lab in the basement of University Hall on Wright State’s Dayton campus. It houses five simulators classified as “medium fidelity.” They can replicate heart and lung sounds, pulses, blood pressure, and coughing. Some of these medium-fidelity simulators can even say a few simple words. Simulation is just part of the college’s continued effort to engage students in active learning. The lab is also home to one “high-fidelity” simulator, which features realistic chest movements, multiple pulses, eyes that open and close, and a voice that can be controlled by an operator with a microphone. High-fidelity mannequins can even turn blue and shake to simulate choking or cardiac arrest. Yet the University Hall simulation lab is only the tip of the iceberg. 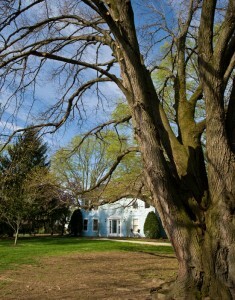 Several classes take students to a two-story house in nearby Centerville known as the Living Laboratory. Located on the grounds of Bethany Village senior living community, the Living Lab is operated by Graceworks Lutheran Services and the Nursing Institute of West Central Ohio. The Lab is home to the Techys, a “family” of robotic simulators, all monitored by surveillance cameras and remotely controlled from a command center filled with monitors and microphones. The Techy family includes four high-fidelity adult mannequins (one of which is capable of simulating childbirth and the various complications that could occur during delivery), a high-fidelity child, three medium-fidelity children (a newborn, a toddler, and an older child), and two low-fidelity mannequins that mimic the wrinkles and age spots of elderly patients. Not all simulations feature state-of-the-art technology. “We’re able to give our students a variety of simulation experiences to supplement their clinical hours,” said Smith. Because the Living Lab is an actual house, students can simulate home health visits, looking at their surroundings from a community health perspective. Because the Living Lab is an actual house, students can simulate home health visits, looking at their surroundings from a community health perspective. They are trained to assess each room of the home for potential health and safety risks, checking for things like mold or dangerous chemicals. Smith even goes as far as hiding plastic cockroaches and stuffed mice in some of the rooms to test students’ observation skills. The simulators also give students an opportunity to practice situations that they are unlikely to encounter before they graduate, such as caring for a dying patient or calling to provide a report to a patient’s doctor. By incorporating simulation into as many classes as possible, faculty members hope to build students’ confidence as well as their nursing skills. That strategy seems to be working. Student feedback after simulations tends to be overwhelmingly positive. “It’s great to be able to practice a new technique without the fear of actually hurting a patient if you make a mistake,” said senior nursing major Jenna Rasar. By incorporating simulation into as many classes as possible, faculty members hope to build students’ confidence as well as their nursing skills. 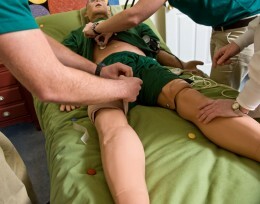 Though many nursing schools use simulation, the college has chosen to make it an integral part of its students’ education. 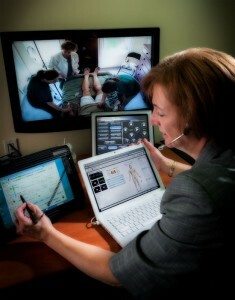 Starting in the fall of 2012, students will participate in some form of simulation in every class that has a clinical component. It’s part of the college’s continued effort to engage students in active learning. The college is designing progressive levels into the new simulation activities, with more challenging experiences as students move through the program. Students will be introduced to the simulators in their very first course. They will be given the opportunity to touch a mannequin and just generally “check it out.” In their next course, they’ll practice talking to the mannequins and treating them like real people. Later, they’ll move on to checking vital signs, providing care for simple conditions such as wounds, and so on. One option currently in the works is a joint experience with students in Wright State’s Boonshoft School of Medicine (BSOM), which has a simulation lab on the Kettering Medical Center campus. There, CONH students will work with BSOM residents to rehearse emergency room scenarios. Another potential collaboration with BSOM involves medical and nursing students discussing case studies in an informal group setting. A collaboration with the BSOM Calamityville staff will also provide students the opportunity to simulate disaster responses with other health care workers. The CONH faculty are looking into other possibilities for simulations from online Second Life and “Choose Your Own Adventure”-type exercises to virtual reality drills in the Wright State Research Institute’s Appenzellar Visualization Lab.